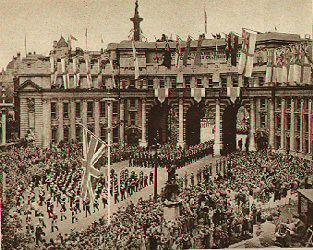 "A specially warm tribute of applause was forthcoming from the crowds all along the Victory Parade route as the troops of our Allies marched by; and as they passed the saluting base, the war leaders grouped there beside the royal dais made grateful acknowledgement to the flags of countries whose men had fought side by side with our men. Headed by the Guards band the representatives of Allied forces were led by the United States, whose contingent included the Marine Corps. 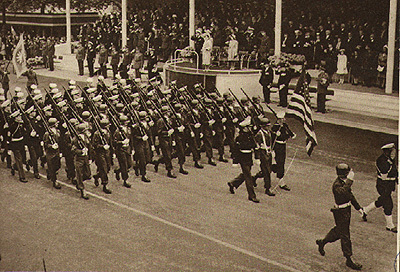 After the American contingent came the troops of China, occupying the place in the procession originally reserved for USSR, and behind them cane contingents with a bewildered variety of flags and uniforms - France, Belgium, Brazil, Czechoslovakia, Denmark, Egypt, Ethiopia, Greece, Iran, Iraq, Luxembourg, Mexico, Nepal, Netherlands, Norway and Transjordan. Apart from the USSR, only Poland and Yugoslavia were not represented among our Allies...."
You will find the above paragraph in The Illustrated London News - Victory Parade Number, issued June 15, 1946. It’s almost word for word to what we had heard on radio at the time, as angry and astonished, we listened the commentaries of the BBC man. How the hell it came about; we the first ally of England, fighting side by side the British soldiers from the very beginning of the war, and now, when it’s all over, we are not represented? Argentine, who declared war on Germany practically a few days before Germany surrendered, and now she is represented on the parade? Did the British soldiers ever see the soldiers of Iraq or Iran, or Mexico for that matter, fighting beside then? And how about that USSR not being represented? Only the British seemed surprised, for anybody who knew anything about the war, knew that first of all, USSR was an Ally of Nazi Germany - the fact that caused the war in the first place. The USSR — let’s call her Russia, for that’s what she always was - was practically forced to accept proposed partnership of its or hers "capitalistic" enemy, when Hitler, her ally, stabbed her in the back. She was a reluctant Ally from the beginning. Winston Churchill, the Prime Minister of Great Britain, with an eye open for any help, even from "the devil himself", knew exactly how to take advantage of the new political situation. Stalin, suffering initial defeats on the front, had no choice. And thus, an old imperialist and ferocious communist became reluctant Allies. In the darkest moments of desperate defeats, Stalin never abandoned an idea of turning tides of defeats into the conquest of Europe. And now, with a half of Europe under the boots of the Red Army "soldats" he had no intention of conducting world’s affairs with his war Allies - he will have his own Victory Parade in Moscow. Yugoslavia, under protection of it’s own partisan-communist Tito, wasn’t ready to expose too soon it’s tendency of being independent some day, there fore, for the moment, she’ll dance to the tune of the Kremlin chiming "kurants" - she’ll take part in a parade in Moscow. But Poland, which was in the eye of the gathering war storm from the beginning...? Perhaps we should start where it all started.... in the Munich Conference, in September 1938. The then Prime Minister of Great Britain, Chamberlain, returned from conference with a scrap of paper in his hand - Peace in our Time. Pretty soon he realized that Hitler had in his mind just the opposite - War in his Time. And so, day after day, of constant Hitler’s demands, the Government and War cabinet of Britain came to conclusion, that there was no stopping the usurper, the war was inevitable. In May, 1939, agreement of mutual assistance was signed between Great Britain and Poland. That only infuriated Hitler. And so, on the first of September, very early morning, when the sun was still under horizon and frogs croaked in bull-rushes, the Second Great World War began. Poland was defeated in three weeks. In the spring of 1940, France - an Ally of Poland and England as well as the biggest military force at that time - was defeated in four weeks. The Polish Army and Air Force, reorganized in France from September remnants and volunteers, was evacuated to Britain, together with whatever left from British Expeditionary Force. The new Polish Army and Air Force began to organize all over again. The land army, though under British Supreme Command, internally remained under Polish command, but the Air Force, became the integral part of RAF -"rock, stock and barrel". We wore the British uniforms, ranks insignia, saluted the British and each other, the British way. If one saw a man in royal blue ahead of him, he didn’t know to what nationality he belonged. The British RAF authorities, including the "big chief", Lord Dowding, were skeptical as to the abilities of Poles , flying modern machines, in spite of the fact, that many Poles already flew the French Morans and others, which were not inferior to Hurricanes or first models of Spitfire. But when, during the training flight, the Po1es shot down three or four Messerschmits, the opinion as to their abilities, somewhat changed. That was early summer of 1940 in France, but in England the relatively action-mild spring, turned to hot summer. And sometime in July, volens nolens, the Battle of Britain began. September l5th, the Germans reached their day of no return. Poles in number of 139 took part in that struggle and shot down 203 enemy planes, thus contributed well to Churchill’s famous: Never in the field of human conflict, was so much owed by so many, to so few." But political amity between England and Po1and, soon changed. In June 1941, the bosom friends, Hitler and Stalin, were at their throats. Thus, more per forza than per amore, England got herself more powerful Ally. The problem was, that this new friend of England, was not only deadly enemy of Poland, but also had his eyes on her property. The whole world took a deep breath, as Hitler said, but Eng1and bean to breath easier; the whole fury of nazism as promised in " Mein Kampf", turned it’s eyes towards the East. From now on, the two words "Eastern Front", will dominate the political scene until the end of the war. In December 1941, Japan attacked USA, and Germany declared war on USA - so much better for England, one Ally more. But the main action of USA was on the Pacific Ocean, but in defense of England, it contributed The F1ying Army. From then on, until the Invasion in June 1944, RAF and US Air Force, will be the only forces on the "Western Front". As the war drugged on, it became clearly evident, that the Easter Front was going to decide the fate of Europe - Stalin knew it, Churchill knew it and Roosevelt knew it; and they all knew, that unless England and USA open the "Second Front", as Stalin constantly demanded, somebody will have to pay him for his effort of saving the capitalists fro total annihilation. There is nothing more rewarding, than nice piece of real estate. Since Stalin’s requests for the Second Front, kept on falling on the deaf ears of his Western Allies, he knew that Churchill and Roosevelt will be less obstinate in compensating him with piece of Poland. In December 1945, the grand trio - Churchill, Roosevelt and Sta1in - met in Tehran for the first time. It was there, when Stalin put the map of Europe on table and with sharp red pencil, delineated the new borders between USSR and Poland after the war. The writer of this article is not historian, nor a cool political scientist; he is a simple man and puts his thoughts in simple terms. He doesn’t know exactly who agreed first to Stalin’s proposition, but he remembers him and some of his colleagues listening to BBC and Churchill relating the above matters in the House of Commons. Russian’s demands, he said, were "right and just". We hard1y be1ieved our ears. Here, our great Ally, almost semi god, good friend, is rewarding our deadly enemy with our territory, for his efforts of defeating our common enemy. Chills froze our hearts, and these are not empty words - that was our native land being bargained. And thus, Poland was pushed on a slippery, political skid row. Stalin was like a professional beggar - you gave him once, he will outstretch his hand and asks for some more. And since Churchill and Roosevelt were generous, every time he got something. Roosevelt’s appearances on all conference were important due to the fact that USA was an economic furnace, fueling its Allies with all sorts of goodies. Many people believed that he couldn’t care less about Europe at the time, with Japan being his problem. For Churchill, as he loved to brag, Europe was the cross on his shoulders. Battles at Stalingrad and at Kurks on the Eastern Front broke the backbone of the German armies. Slow, deadly, Napoleonic retreat of the German armies began. And as the Red Army mowed West, Stalin’s appetite increased. One conference after another, each time his demands were "reluctantly" approved by Churchill and seconded by Roosevelt. Half of Poland was already granted to him, but to get to Berlin he had to swallow the rest of Poland. Oh, yes! Of course! Poland was going to be "sovereign, independent and absolutely democratic", but somewhat tinted red, to Stalin’s vision of all democracies. On January 17, 1945, the Red Army "liberated" Warsaw. Two days later, pro-communist government established by Stalin, assumed control over "free" Poland. On February 15, the last Allies Conference in Yalta took place. Stalin achieved all he wanted, and perhaps, to appease the guilty conscience" of his partners in connection with Poland, relented to let the communist government of Poland play democracy "the British sty1e" until its boys, the last Polish soldiers, airmen and sailors in West return home. On July 5th, Great Britain and USA recognized the communist regime in Poland. Unless you are one of those who were there, you will never know what it means to be suddenly in the limbo - nobody wants you, and you have nowhere to go. Nevertheless, we were not fooled. Many of us had experience in the "Siberian democracy". Yet for various reasons, many of us chose to return. It must be said, that Great Britain, hosting so many thousands if not millions of people of different nationalities for five years - though knowing the reasons why they were there, and tolerating their foreign peculiarities - was really glad to see them off goodbye. All the pent-up animosities and prejudices accumulated through the wartime, just waited to be vent on something or somebody. The country was short practically of everything, from food and fuel to.... ladies underwear. And here, the thousands of "gallant" soldiers; whose country was "free, independent and democratic", decided to stay here. Only a few Britons knew and understood why these "bloody foreigners" didn’t want to go home. The rest of the public, just simply wouldn’t care. It also must be said, that the above fact caused a great dilemma for the British Government. It tried and mostly succeeded in finding work and homes for those who decided to stay in England. It also paid for the bonvoyage for those who decided to emigrate. But before the administrative machinery of such huge venture went into action, as never before, we had a chance to find and see the other side of the civilized British society. And only those who lived in the British colonies were not taken aback by hue and cry: "Polacks go home! We don’t want you here!" Even in the best of times, during the war comradeship, we who flew in British squadrons, always felt as being on the other side of the invisible barrier; them and us. No doubt that the superior British upper lip, has it’s "good points", and can be quite attractive on occasional, social encounters, but unless it’s subdued and under control, it betrays the ugliest trait of character. After such encounter, no Briton is quite the same. Until this day, the writer of this essay has hundreds of newspapers cutouts, depicting the ferocity of those very unpleasant days. And no matter how well he tries to rationalize those events, the image of the British society, was tarnished once and for all. It was then that we understood, what it meant to be some dark skin colonial. And it was in such circumstances and atmosphere, when in May, as I recall, some of us heard and red in papers, of the forthcoming Victory Parade. Quite frankly, we accepted it with a proverbial "shrug of shoulders" - THEY will not invite US anyway. Hadn’t we fought for that victory? We wanted to go but the invitation was not forthcoming. And then, a week or so later, a slap in the face - only the pilots who took part in the Battle of Britain were to be invited. Stunned? No. Surprised? Not quite, for almost a year now, we went through "Polacks this, Polacks that ". Despite all this disappointments, incredibility, and all that, some of us felt, that there was some kind of reason for British acting in so "un-gentlemanly" way. Though by then, every Englishman was a S.O.B. in our eyes, some still looked for bright sides. Those invited refused the invitation and stated without hesitation: contingents representing each service or none at all. And so, none it was. A bit of time lapsed, before the reasons came out to surface. 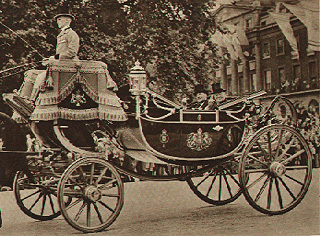 Since Great Britain already recognized new Polish government in Poland, and thousands of Polish servicemen, legally Polish citizens, were still in England, it would be diplomatically correct, to invite a contingent of each service from Poland, and together, in fraternal unisons with the "local" soldiers, take part in Victory Parade in London. At the time, we couldn’t get over the fact, that the British Government, dealing with Stalin for several years, were so naive as to think that the so called "Polish government totally subservient to USSR, would sent it’s contingents, to join their compatriots in England. We hated the communists, especially the Polish ones, and would rather vegetate abroad, than to return home and be dominated by them. Later on, we heard some rumors, that apparently, the Polish authorities were ready to sent a contingent of men, but at last moment, received a "message" from Moscow: " What’s going to happen, if your soldiers get captivate by fascists in England and never return?" That did it. As I said, it was probably just a spiteful gossip, but there is a kernel of truth. We speculated a lot concerning the above, but in the end came conclusion, that British were not naive at all, they new exactly what they were doing; running so vast an empire, has taught them a lesson or two. What we thought might have been diplomatically correct, proved to be diplomatically expedient. To put it bluntly: if you don’t want to come here, and you who are here don’t want to go there, the hell with you all. 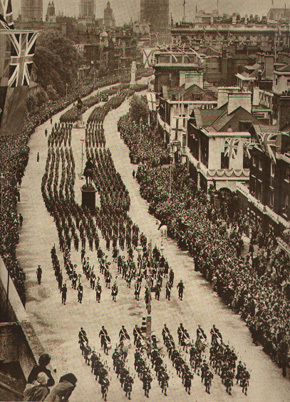 As I am leafing through the yellowing pages of the London News Magazine, and looking at the sepia photos of the marching columns of the Allies servicemen, it’s the illustrious ones, watching the parade and taking all the salutes that draw my attention; the Royal Couple on the saluting base and Winston Churchill, sitting below. As I recall, they were the most frequent and important visitors of our squadrons during the war. Were they aware of the fact that the first and loyal friend was not represented among the victorious Allies? For if they were, and I am sure they were, what were they thinking? To what degree were they responsible for that fact? If the Royal Couple felt guilty, they could not do much about it. Undeniable master of this parade was Winston Churchill, who pulled all the strings. True, he was out of the office at the time, but he carried such a prestige on his shoulders that one word from him could have changed the decision of the Parade Commissioners. If the communist Poland does not want to send its contingent to London, to take its part in the Parade, let those soldiers who are still in England to march side by side, as they fought side by side, with British soldiers. But that was not to be so. Churchill knew perfectly well, that the Communist Government in Warsaw was just bunch of Kremlin’s stooges, the government he helped to create, and the real master of Poland was "uncle Joe". Perhaps it was in interest of England not to irritate, the new master of the half of the Europe, but Churchill’s whole political carrier was to take decisions against the established scheme of the things. Surely, one more irritation of Stalin would not hurt either of them. We all know, that in political games, when one of the partners becomes just a marginal affair, it’s the personal relations with that partner that decides the further course of events. The well-known fact is, that Churchill didn’t like Poles. Some parts of his Story of the Second World War (Six volumes! ), as well as his friend Sir Alexander Cadogan’s diary of 1938-1945, reek – to put it gently – with negatives about Poles. Perhaps it was caused by their relations with some of the members of the Polish Government in Exile in London? Some of its members were sincerely disliked by the Poles themselves, who saw them as a clique of nationalists, with the hunchbacks full of animosities from way back, constantly bickering among themselves and everybody else. Churchill and Cadogan could have been influenced by this fact. Perhaps the spoon of Polish tar spoiled the political honeymoon with the first of England’s Allies. We gave our souls to God, Our hearts to Poland, Our bodies to the British soil. That about tells the whole story, why those who remained after the war, and those who are still alive, were never invited to Victory Parade. Time gradually heals all the scars, but memories stay forever. Left: Author of this article. 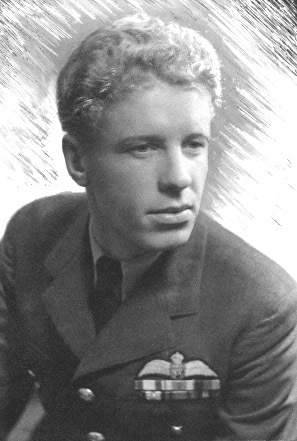 He flew with 635, 639 and 303 squadrons. 1. Truly a royal entry for a man who inspired victory. In a state landau and through cheering crowds, Winston Churchill is making a "V" sign. Next to him seats his former second-in-command, Prime Minister Attlee. 2. Marching contingents were entering the mall through the Admiralty Arch. 3. The Stars and Stripes followed by the contingent representing American services.